Invisible dark matter particles may regularly pass through our bodies, and dozens to thousands of these particles may be colliding with atoms inside us every year, according to a new calculation. However, radiation from these impacts is unlikely to cause cancer, investigators added. Dark matter is one of the greatest scientific mysteries of our time — an invisible substance thought to make up five-sixths of all matter in the universe. Scientists think it might be composed of things called weakly interacting massive particles, or WIMPs, that interact normally with gravity but very weakly with all the other known forces of the universe. Its ghostly nature makes it exceedingly difficult to directly prove whether dark matter really exists or what its properties really are. Dark matter is largely thought to be intangible, its presence detectable only via the gravitational pull it exerts. Scientists calculated how many times dark matter particles ought to collide with atomic nuclei in adult-size bodies — lumps of flesh about 154 pounds (70 kilograms) in mass largely composed of carbon, hydrogen, oxygen and nitrogen. Dark matter should most often collide with the hydrogen and oxygen nuclei in the body — the former makes up 60 percent of the atoms in the body, while the latter makes up about 60 percent of the mass of the body. Given the most common assumptions regarding what dark matter is, roughly 35 impacts between dark matter particles and atoms in your body should happen annually. However, if the latest models are correct and dark matter interactions are more common than previously thought, there might be about 100,000 collisions annually for each human on the planet. "Before we did these calculations, I had been under the impression that on the average, one WIMP would hit one of the nuclei in a human body in about 100 years. In fact I used to joke about the 'WIMP death theory,'" said researcher Katherine Freese, a theoretical physicist at the University of Michigan in Ann Arbor. "Instead, it turns out that the number of WIMP interactions would be so much more frequent — as many as one per minute." 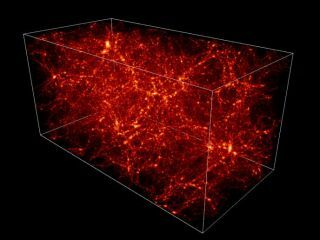 Though recent research has suggested that our corner of the universe is actually not bathed in dark matter, Freese did not find this work compelling. "The stars they looked at are 1.5 to 4 kiloparsecs (4,892 to 13,046 light years) below the galactic plane — nowhere near the sun," Freese said. "I wouldn't trust their extrapolation to the solar neighborhood, which relies on a lot of assumptions." The researchers also calculated whether the energy released from dark matter-human body impacts might cause cancer. "We discovered that WIMPs are harmless to the human body," Freese said. "WIMPs are clearly a source of radiation, and their collisions could in principle be dangerous to humans," Freese said. However, "we discovered that the answer is no. Other naturally occurring sources of radiation, from radon and cosmic rays, are a much larger problem for us. This is not unexpected, since WIMPs only interact via weak interactions, whereas cosmic rays are charged particles and thus have electromagnetic interactions, which are much more common and exchange more energy." Freese and her colleague Christopher Savage plan to submit their findings to the journal Physical Review Letters.